A visit to the Dubai museum will offer fascinating insight into the history of Dubai. For a very interesting collection of old photographs, visit the house of Sjeikh Saeed Al Maktoum puts. If you like traditional arts and crafts, a visit to The Heritage and Diving Village is a must. You can also visit the oases of Khawanij and Awir, approximately 15 miles inland. In the past 20 years these oases have been extensively developed and offer a home to Dubai's leading families with impressive country houses and extraordinary gardens. One of the largest and most beautiful mosques is the Jumeirah Mosque. It is a spectacular example of modern Islamic architecture. The mosque looks especially beautiful at night, when subtle light is shining on it. Dhow races are of large cultural and historical importance to Dubai. Races with traditional wooden trade vessels still take place nowadays. Dhow racing is considered to be one of the most spectacular sports. A creek cruise will lead you on a scintillating ride along the skyline of the city. You see the Dhows passing by and catch a glimpse of the fisherman's past of Dubai, or you can take a walk in the Jaddaf district and see the local craftsman hand-carving their Dhows. The Al Bastakiya area dates back to the early years of 1900, and covers the Eastern area of the Old Town along the Creek. This compound represents an important component in the history of Dubai's architecture and the urban development of the city. To the East of the Al Fahidi fort you will find the largest concentration of traditional courtyard houses in Dubai, with their distinctive wind towers. In the past, the city was well known for its enormous quantity of wind towers on both sides of the Creek. 'Souq ' is the Arabic word for "market". In the old days the Dhows from the Far East, China, Ceylon and India used to discharge their freight here, after which the goods were traded on the adjacent Souqs. In the Spice Souq you will find perfumes, incense, and foods. Walk a bit further and you will be dazzled by the wealth of the Gold Souq. Near the Souqs you will find an antique market where you can buy coffee pots, Arabic chests, traditional daggers and Bedouin jewelry. If you are interested in buying textile or silk you should drop by Cosmos Lane in Bur Dubai or the streets of Satwa. For an extensive collection of Chinese products, visit the Dragon Mart. 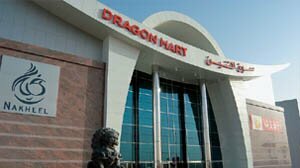 The Dragon Mart is the largest market for Chinese products in Dubai. The building, in the shape of a dragon, is a permanent market with an extensive collection of Chinese products. It is also a tribute to the very old relationship between the Chinese government and the UAE. Spend a day on a luxurious yacht while an experienced captain and crew assist you in catching the best game fish the Arabian Gulf has to offer. Dubai is a true golf paradise: even if you don't play golf, the golf clubs of Dubai are still worth a visit. Both the spectacular architecture of the club houses and the examples of greening a desert area make it worth your time.